Occasionally S will completely kick me out of the kitchen and make a meal for me. 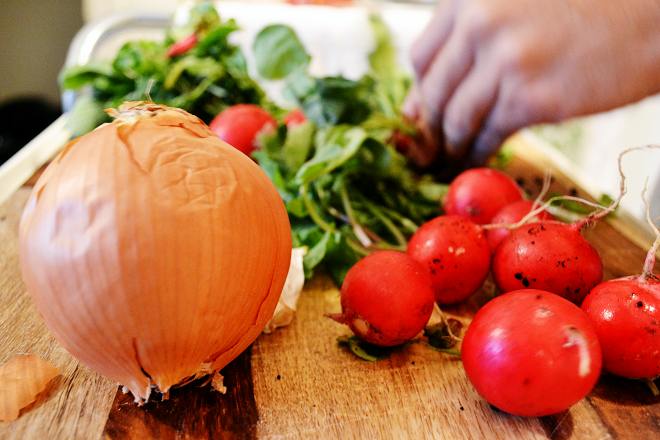 It's really hard for me to stay out of the kitchen while any one is cooking a meal because I really enjoy it, and I'm also a bit controlling about messes. However, this meal was a nice balance of S making dinner and me playing sous chef without worrying about the mess. 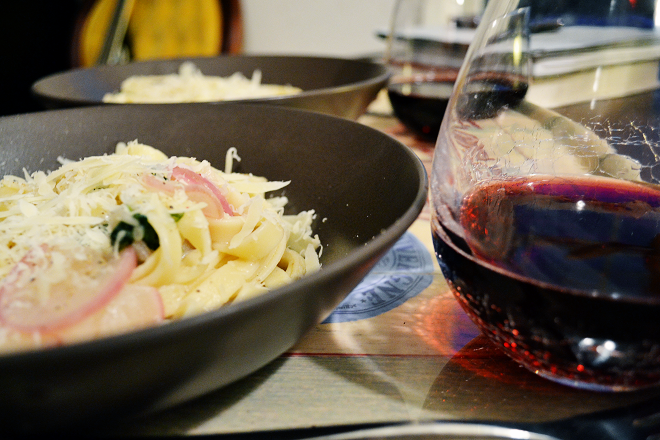 There are times that I can truly get lost in the sizzling in a pan, the vinyl playing in our record player, and the glass of wine on the counter. This was one of those times. 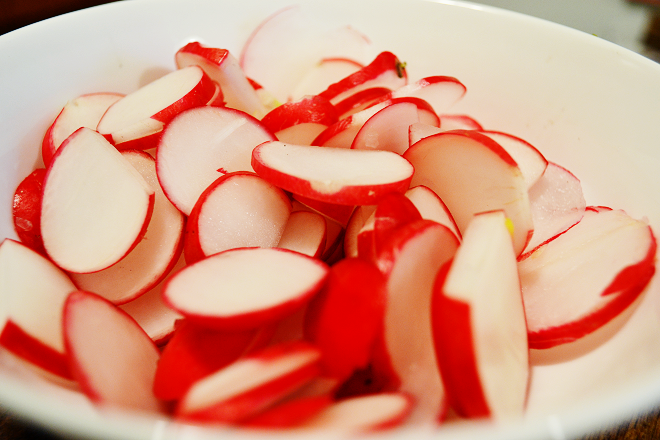 S let me wash and slice our fresh radishes from the farmer's market. Even raw, the little white and red saucers were delicious. 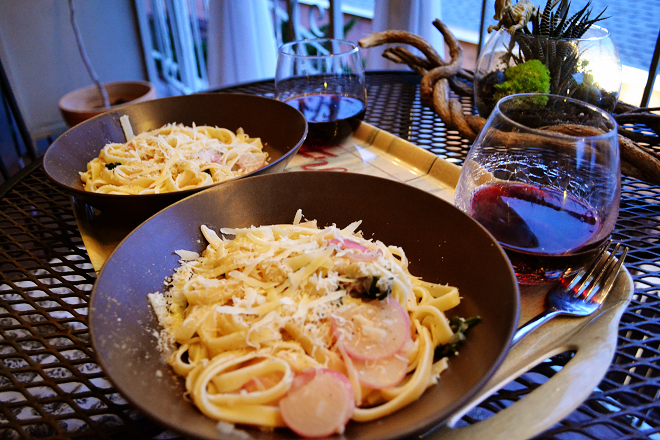 The recipe called for using the greens of the radishes as well - something I've never made before! 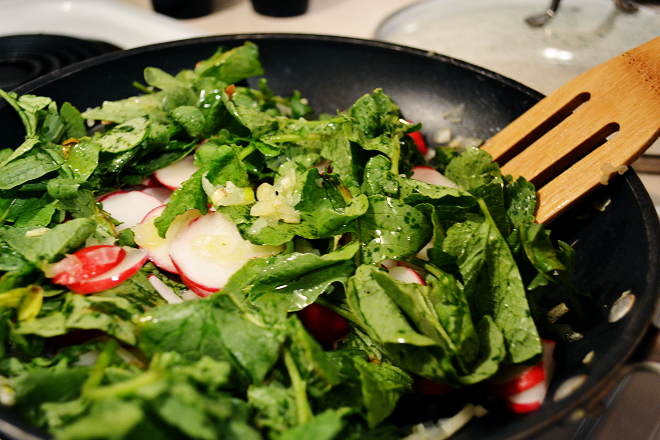 It turned out I loved the taste of the greens more than the taste of the cooked radishes. The green part tasted like a wonderfully rich kale. 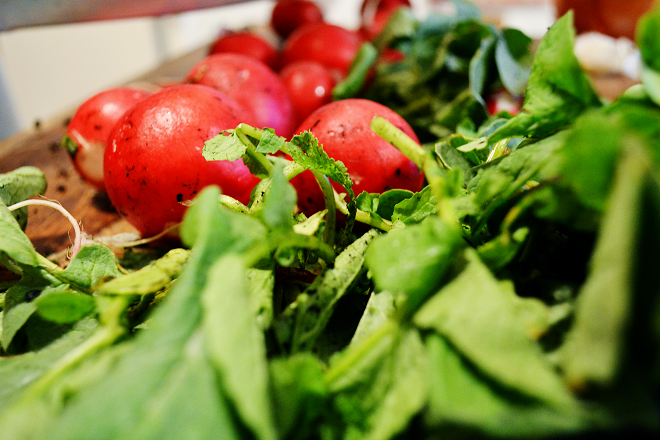 I still think I prefer radishes raw in a fresh salad instead of warmed or sauteed for pasta. We sauteed them to be just translucent and the greens a little wilted. Just enough to pull out the flavors for the pasta. Below, you can see how the red radishes turned to pink. 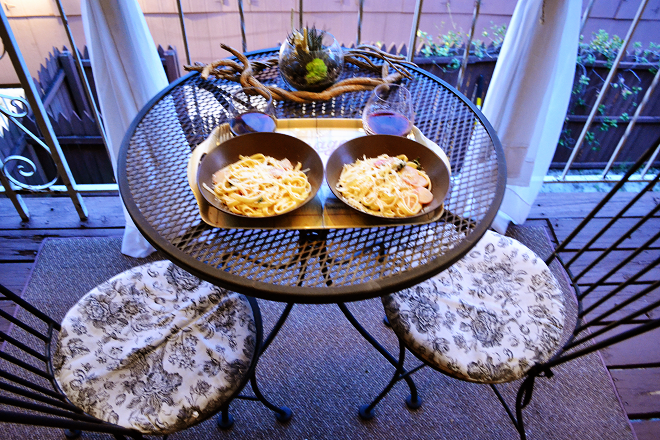 The nights are now warm enough to eat our meals on the balcony, like we do in the summer time. We brought our plates and glasses of wine out to our little bistro table. Slowly, but surely, we are tackling one wedding errand at a time. Now, I just need to find the time to put together some last minute items. Yesterday I spent most of the day studying for my upcoming exams. It was a little hard to concentrate knowing how close I am to being done. But it was also not as stressful, knowing that this will be the last time I ever have to study exams. Unfortunately, it doesn't make it any more enjoyable, but it does take off some of the heat. How fun! I can't wait for farmer's markets in CO! aaahhh the Farmers market! Opens in 1 month here and I seriously can not wait! ;-) looks delicious! You guys are adorable. I'm a nightmare in the kitchen, mostly because I'm not confident and generally don't like cooking anything more advanced than mac n cheese from a box (and even then I'm sometimes too lazy to do that. see: last night when I ate chex mix for dinner). J does all of our cooking and I follow behind him cleaning up, and then I clean up at the end of the meal. It's a good trade off. That pasta looks yummy! looks yummy to me! 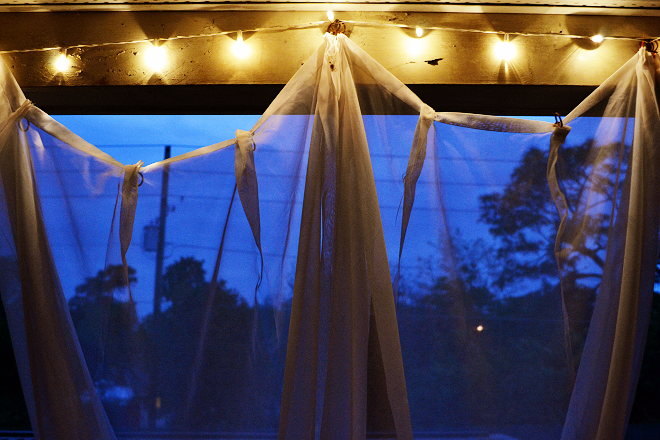 your balcony is so cute, the curtains just give it that soft, whimsical feel. perfect for summer nights :) i'm going to miss our little patio, our apartment downtown doesn't have an outside space--but i'm sure we'll find some parks or something to make up for it. hope your exams go well! Looks wonderful! One day I will teach my husband how to cook..... One day! What a lovely meal for two. I wish someone would kick me out of my kitchen every now and then and cook a meal for me. Best of luck with those exams! I prefer my radishes raw too. I just love that crunch. But this looks delicious!